By now I think that everyone knows about the Vegan Cuts Beauty Box, but occasionally I come across someone who has never heard of it. If you’re unfamiliar with it, let me introduce you. It’s a beauty box service where subscribers receive a box full of cruelty-free beauty products delivered right to their door once a month. The box contains samples of vegan cosmetics skin and care products for chic vegans can try. (Sometimes full sized products are included too!) If the products are liked, full-sized counterparts can be purchased in the Vegan Cuts Marketplace. It’s the perfect way to try new products without spending a ton of money, and it’s a great way to learn about new brands. It’s also wonderful for new vegans who are just beginning to dip their toes into the world of cruelty-free beauty. 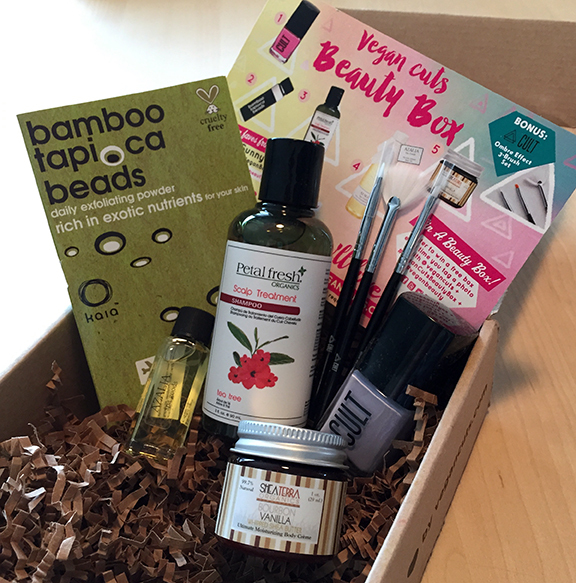 I’ve been receiving the Vegan Cuts Beauty Box to review for a year now, and every month I look forward to the box’s arrival with great anticipation. What will I find inside this month? Will there be nail polish? Is there going to be a wonderful new skin treatment? Will I smell great after using everything? The answer to all of those questions this month was yes! The box contained polishes, scrubs, moisturizers, and even brushes. It was all I was hoping for and more! 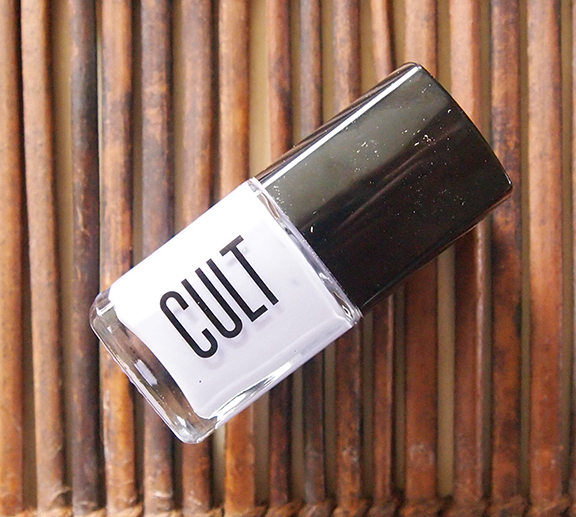 Cult Cosmetics Nail Polish – This California-made nail polish is 5-free, which means it is free of Formaldehyde, Formaldehyde Resin, Dibutyl Phthalate, Toluene, and Camphor – all of which are ingredients you don’t want touching your skin. I received The Roxy, which is a pale lavender shade and perfect for summer. The polish went on smoothly, it only needed two coats for opaque coverage, and it hasn’t chipped or cracked – all characteristics I love in a nail lacquer. Petal Fresh Scalp Treatment Shampoo – This shampoo is made with organic tea tree oil to invigorate the scalp and hair. It nourishes dry, damaged hair and leaves behind a healthy scalp and shiny locks. It has a fresh, minty scent that will wake you up in the morning. Bamboo Tapioca Beads – This powder can be used as a cleanser, exfoliator, face mask, and makeup remover. To use, simply mix with a liquid such as water, face oil, or green tea. 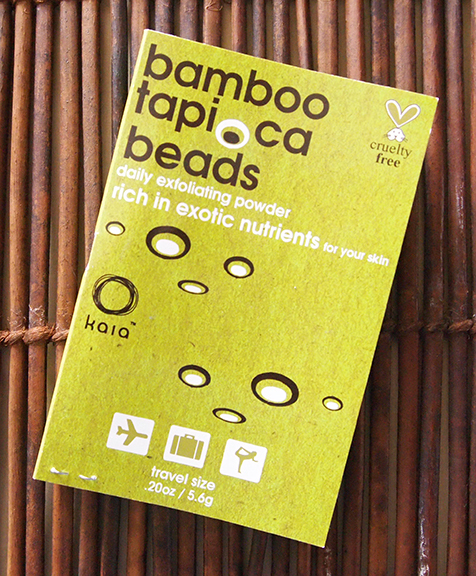 It’s made from bamboo beads, white clay, tapioca powder, chickpea powder, and coconut fatty acid, and it’s formulated to exfoliate the skin, remove impurities, absorb oil, tighten pores, and gently cleanse. Shea Terra Bourbon Vanilla Whipped Body Butter – This sweet smelling body butter is made with whipped shea butter to soften and smooth dry skin. Azalea Spa Goods Refreshing Grapefruit Oil – Sunflower oil, jojoba oil, and vitamin E oil are mixed with pure essential oils of grapefruit and mandarin to protect, restore, and sooth skin. The scent is light and refreshing and perfect for spring. Cult Cosmetics Brushes – This 3-brush set is designed to create the season’s hottest manicure trend – the ombre mani. The Beauty Box is available as a monthly subscription, which means that once you sign up, a new box of products gets delivered to your door every month. If you like the samples in your box, you can order their full-sized counterpart from the Vegan Cuts Marketplace.